Tick the boxes below to search by category, or type a curriculum code into the field underneath. 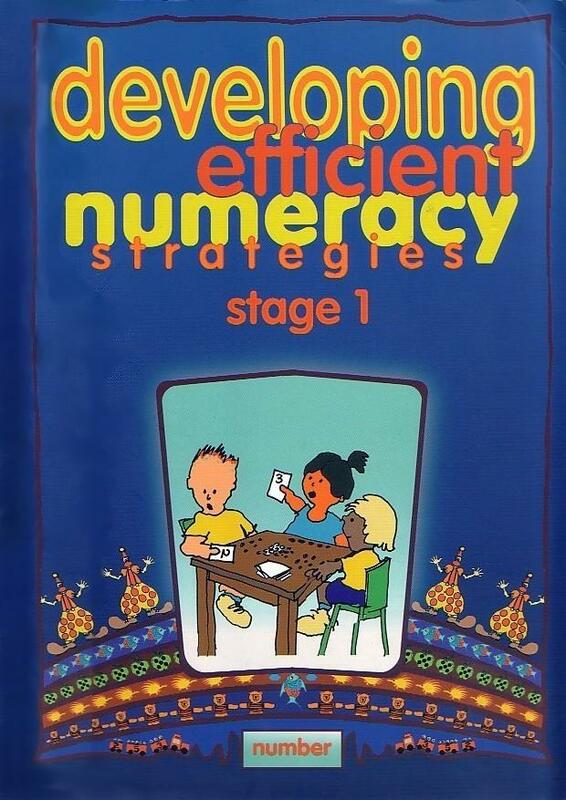 Enter an Australian Curriculum Content Description (eg ACMNA057) or NSW Syllabus Outcome (eg MA2-6NA). What are the characteristics of schools where students do well in mathematics? What strategies do teachers use to assess students’ progress and engage them in meaningful mathematical learning? 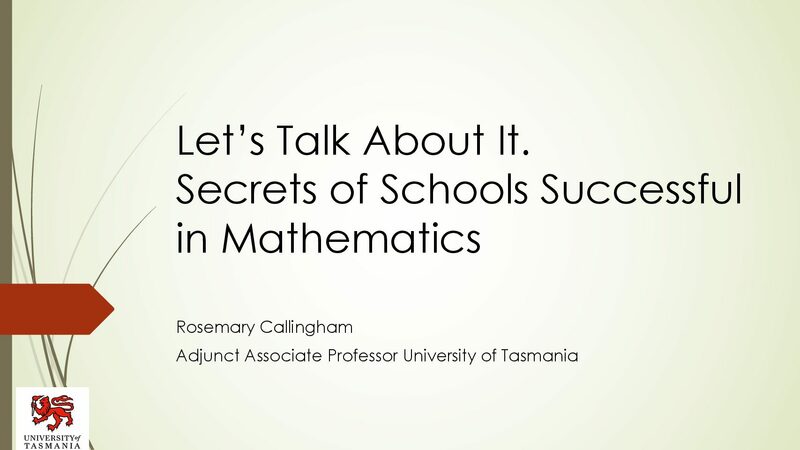 Drawing on several recent research studies, this presentation will focus on what schools do to support mathematics learning and how they achieve their goals.Presenter: Adjunct Associate Professor Rosemary Callingham, University of Tasmania. 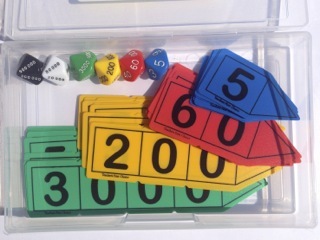 Contents – Place value arrows: The set contains 40 plastic place value arrows (10 x blue 0-9, 10 x red 00-90, 10 x yellow 000-900, 10 x green 0000-9000). Contents – Place value dice: The set contains 6 ten-face dice (blue 0-9, red 00-90, yellow 000-900, green 0000-9000, white 00 000-90 000 and black 000 000-900 000). How used: One set per pair. How packaged: 40 arrows and 6 dice stored in a Fischer clear, hinge-lid, small 1 compartment, shallow storage container (18.5 x 11.5 x 3.2) cm. How stored: Class kit of 8-15 sets of containers stacked and packed on a designated maths shelf in the classroom. PV Arrows – DIY: Make these yourself using Anita’s printable BLM. 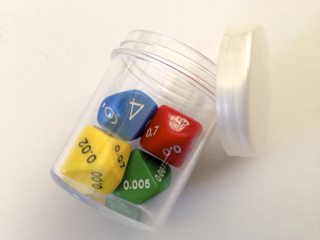 How packaged: Set of 4 dice in a clear 30 mL mini-round jar with screw top lid. Modern Teaching Aids $1.65, 4 pce set. Container (shown): 30 mL mini-round jar with screw top lid, 4 cm diameter x 5 cm. Holds up to 4 ten-face dice. Holds 20 counters. Container (alternative option): Decor brand, 35 mL dressing tubs, snap on lids (difficult for young children to open), 4.8 cm diameter x 4.1 cm. Holds up to 6 ten-face dice. Holds 20 counters. Spotlight, $5.99, 6 pack (GST incl as at 2/2/19). Contents: I uniquely identify each set of 52 cards (10+3)x4 so when cards are lost, but then found, it’s easy to return them to their home! Eg. I mark one yellow set with a X in one of the white circles in a corner. I mark a 2nd yellow set with a X in two corners. I mark a 3rd yellow set with a • in one corner. I mark a 4th yellow set with • in two corners. I then do the same for the green, red and blue decks. How used: One deck per pair. Ie one container per 4 students. How packaged: 2 decks (yellow & green OR red & blue) in a clear Decor Tellfresh Oblong 250 ml container (11 x 8 x 5.5) cm. The decks are separated by the court cards (J, Q, K) for both decks which are held together with an elastic band (size 12). How stored: Class kit of 8 containers, Ie 16 decks of cards, stacked and packed on a designated maths shelf in the classroom. Rubber bands (size 12): Supermarkets, newsagents. Contents of class kit: 32 individual sets (each set in a snap lock bag, snack size, 15 cm x 10 cm) of 30 pattern blocks. 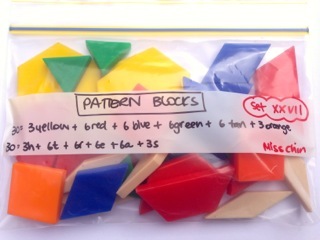 Contents of one set: 30 pattern blocks, 5mm, thick solid plastic (quiet on tables). 6 x blue rhombuses, 6 x green triangles, 3 x yellow hexagons, 6 x tan rhombuses, 6 x red trapeziums, 3 orange squares. How used: One set per student. How packaged: Class kit in a Fischer clear, hinge-lid, large 1 compartment, storage container, deep (35.5 x 27.4 x 10) cm. How stored: Class kit stacked on a designated maths shelf in the classroom. 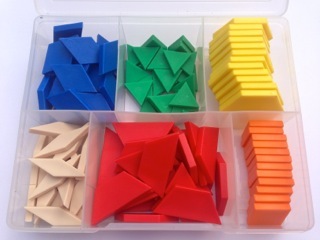 Modern Teaching Aids, $41.64, 500 pieces (100 x rhombuses, 100 x triangles, 50 x hexagons, 100 x tan rhombuses, 100 x trapeziums, 50 squares. Snap lock bag, snack size, (15 x 10) cm: Supermarkets Eg Woolworths, $2.80, 65 pk. How used: One set per pair, Y3-4. One set per individual, Y5-8. How packaged: Each set in a labelled snap lock bag (snack size, 15 cm x 10 cm). Class kit in a Fischer clear, hinge-lid, large 1 compartment, storage container, deep (35.5 x 27.4 x 10) cm. Snap lock bag, Hercules snack size, (15 x 10) cm: Supermarkets Eg Woolworths, $2.80, 65 pk. Contents of one set: 120 pattern blocks, 5mm, thick solid plastic (quiet on tables). 24 x blue rhombuses, 24 x green triangles, 12 x yellow hexagons, 24 x tan rhombuses, 24 x red trapeziums, 12 orange squares. How packaged: One set in a Fischer clear, hinge-lid, medium 6 compartment, storage container (19.5 x 15.5 x 4.6) cm. 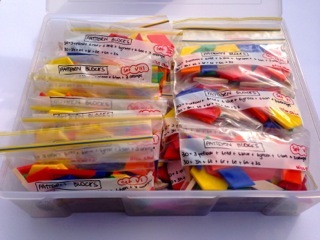 How stored: Class kit of 10 sets of 120 pattern blocks stacked and packed on a designated maths shelf in the classroom. 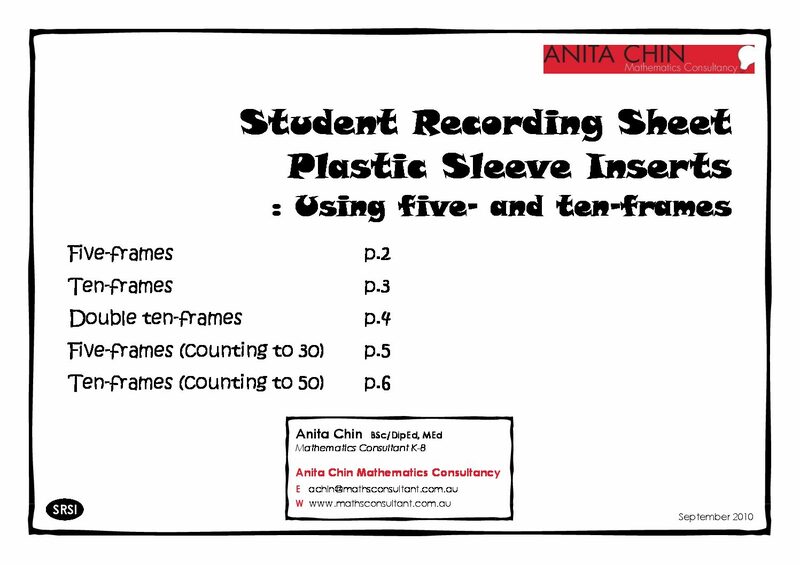 How stored: Class set in a filing tray or standing upright on a designated maths shelf in the classroom. Avoid storing in students chair bags as this will damage the whiteboard sleeves. 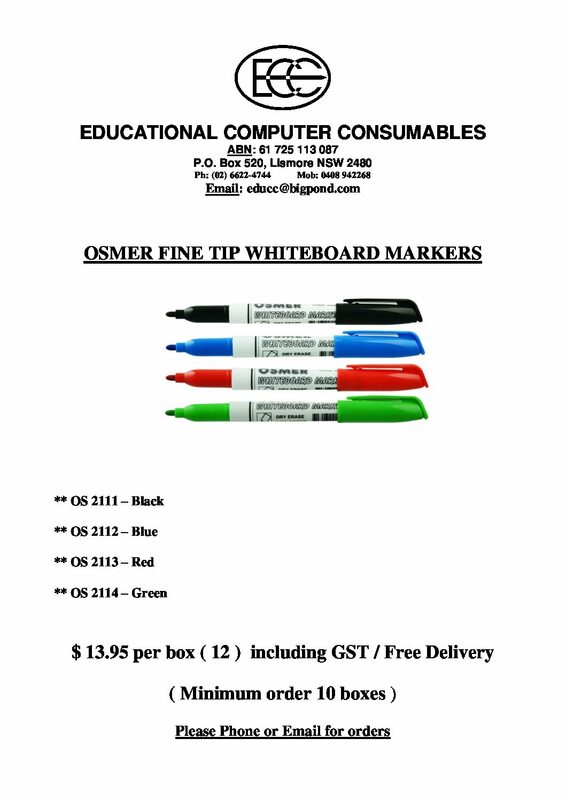 Educational Computer Consumables (price GST incl as at 4/4/19): $2.99 each and comes with a black student marker. Side opening, 4 colours. Best quality. Always in stock. Local Australian supplier. Free delivery within 1-4 days. Minimum order 50 pieces. DIY alternative: plastic Sheet Protector Sleeves. Officeworks, $10.88, pack of 300 light weight ($0.04 each). Officeworks, $10.67, pack of 50 heavy weight ($0.21 each). Only have students use black coloured marker pens on their whiteboards. Educational Computer Consumables (price GST incl as at 4/4/19): $13.95 box of 12. 4 colours. Best quality. Always in stock. Local Australian supplier. Free delivery within 1-4 days. Minimum order 10 boxes. Contents: 12 hundreds charts ranging from 1-100 to 1101-1200. How to make: (A) Photocopy my 12-page printable Hundreds Chart Book: 1 to 1200 back-to-back onto white A4 paper. (B) Place each sheet into one sleeve of a 20 Pocket Clear Cover Display Book. How used: One per student as required. How stored: Class set in a book box placed on a designated maths shelf in the classroom. Make this DIY resource yourself by using Anita’s printable BLM. 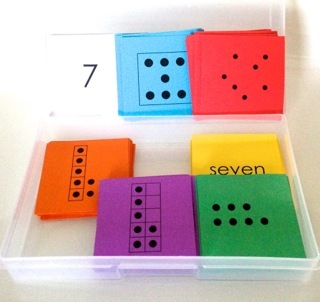 Contents: 77 cards with 7 different representations of the numbers 0 to 10. (A) You will need 7 different coloured sheets of A4 card, 100 GSM. (B) Photocopy each representation from Anita’s printable Number Representation Cards 0 to 10 onto it’s own sheet of A4 coloured card to allow students to “sort all the cards by colour”. Eg number names (p9) on yellow; numerals (p8) on white; five-frames (p6) on orange; ten-frames (p7) on purple; dice dot patterns (p2) on blue; pairwise dot arrangement (p3) on green; random dot arrangement (p4) on red. (D) Place the same coloured sticky dot on the back of each card and one on the bottom of the container. (E) Place cards in the box, no laminating required. How used: One container per pair of students or per individual for intervention. How packaged: To uniquely identify each container of cards I place a coloured sticky dot (eg all cards in container 1 have a blue dot on the back of each card). Each different container has cards with a different coloured dot (eg all cards in container 2 have a red dot on the back of each card). Each set of cards is stored in a Fischer clear, hinge-lid, small 1 compartment, shallow storage container (18.5 x 11.5 x 3.2) cm. 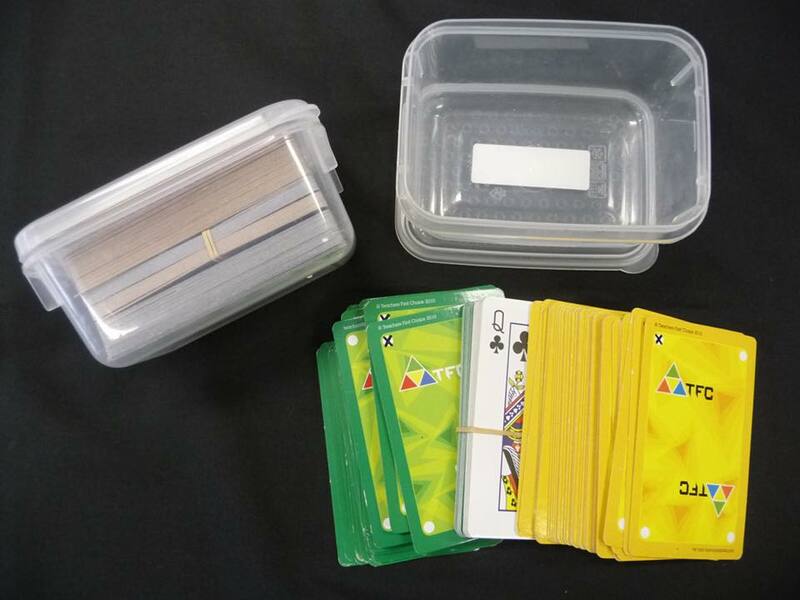 How stored: Class kit of 8 containers of cards stacked and packed on a designated maths shelf in the classroom. Make this DIY resource yourself using Anita’s printable BLM. Officeworks, $8.00 per box of 1050, 14mm, 4 colours. Elizabeth Richards, $4.70 per box of 200, 14 mm, 18 colours.